Call for local businesses B2B: Valley Hi Toyota Dealership Grand Opening coming soon. Though the new Toyota dealership is set to open sometime next month, the team at Valley Hi Toyota is gearing up for an event devoted to bringing the High Desert together. 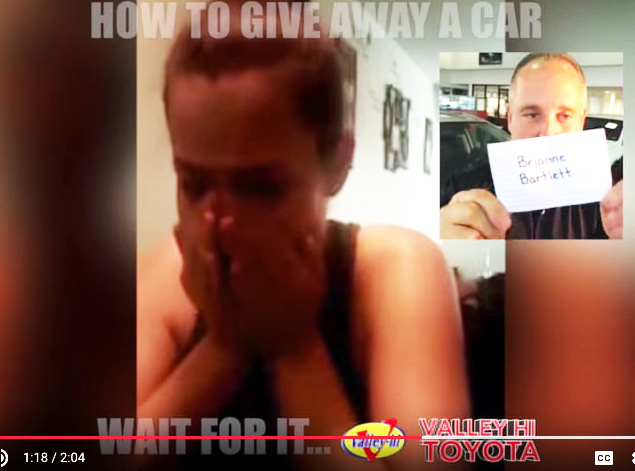 Car Dealership makes it a habit to give cars away using Social Media. Winner announced on Facebook Live last year. Valley Hi Toyota is committed to providing our customers and friends the best possible experience at a car dealership. We' re always looking to improve our Sales, Service, and Parts departments. With our current condition in our temporary dealership adjacent to our state-of-the-art building under construction we realize that the customer experience is difficult at times. So how do you accomodate 101 people that are finalists to win a car in a car dealership? Easy. You host it online. "We jumped on Facebook Live when it first became available to Business pages- and haven't looked back since," says Brian Ortega, Social Media Marketing Manager at Valley Hi Toyota in Victorville. "A lot of our fans just found it more convenient than Periscope or tuning in to our website- so it was a no brainer to host our 13th Used Car Giveaway online." It's been a little over a year since we started the Used Car Giveaway in its latest form, and boy has it made us proud. Our Facebook contest is open to all California, but it seems that all of the winners have been local. From Victorville, to Adelanto, to Apple Valley, to the Lucerne Valley, and Hesperia, it's been quite a ride.